What if your dog, cat, gerbil, hamster, horse, etc. became the Obama family pet? See how great that would look at Pawfun.com! Start here. Upload a photo of your pet here and we’ll show you how to add it to this Obama family photo. Then you can send your friends an e-card (gratis) to show off your soon-to-be-famous pet. You can put the picture on a t-shirt too! It’s quick and easy with the Pawfun Design Wizard. 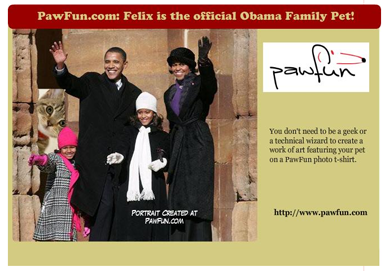 Coming soon: Pawfun visitors will vote on which pet they think should join the Obama family in the White House. Pawfun.com is the new site my partner, Caimin Jones, and I just launched. Please go there to put your dog, cat, horse, gerbil, parrot, hamster or goldfish on a custom photo t-shirt that you design and we print. – Scratchings & Sniffings Blog: Put Your Pet in the Obama Family Portrait! – Lip-Sticking: Bella the Cat Makes the Big Time with the Obamas: Maggie, are you watching? very cool.. wonder if i should choose my jack russell or my golden retriever.. wait.. don’t think either would fit the allergy requirements of the obama dog.. that’s ok.. i’ll keep my pups! Unfortunately a non-allergic dog has yet to be ceated. Benny Bix Ochman Labradoodle has no dander, but his saliva (he’s a kisser) has caused my nephew – who is not allergic to dogs – two asthma attacks. sigh. Congratulations on your public launch. I looked around you site and indeed, your message is clear and well delivered – as I would expect from you. However, I can pretty much guarantee you that you will convert “some sales” to “some more sales” if you do NOT require people to register in order to design t-shirts. Requiring registration before checkout is a bad enough barrier a silly number of businesses put up, but putting a registration requirement where you have one is a barrier to browsing your product – and will kill your sales. Sabrina – Thank you so much for your suggestions! Much appreciated. We’ve come to the same conclusion, and will stop requiring registration to design a shirt. We do have to require registration for checkout, but we hope we can eventually change that too. And we’ll be doing a newsletter shortly. The Portuguese Water Dog makes wonderful pets, and their curly hairs are so handsome. A good choice for the Obama family, now some questions remain: male or female, how will they call it?